My mom tells me that when I was two months old, they took me to place called “Ziro” in Arunachal Pradesh and that is probably why I became a “hill person” or as we say in Hindi parlance a “Pahari”. I still stand by that as hills and mountains is where I feel homely and get the feeling of belongingness. Here is a snapshot of the years that has been so wonderful that I always want to go back. I have spent my childhood, adolescence and pre-adulthood till 2006 in mostly three places Boleng, Pasighat and Roing in the same chronological order and this writeup will revolve around Boleng and my personal experiences. Sorry for those looking for touristy places and information that unfortunately I never visited in my almost 20+ years that I had spend there. Even now when someone asks which is your native state and I always take time to answer as I don’t know which one to say and sometime get through by saying a very cliched thing that “I am an Indian” :-). I am not sure but this probably may be true for many like me whose so called roots are generally not that strong. 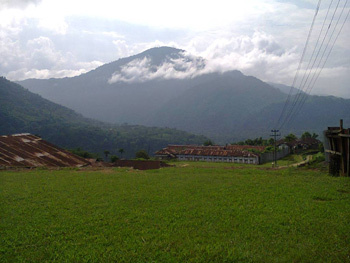 Boleng was a circle headquarter in the East Siang district comprising of many villages in the block. Some of the major villages were Riga,Dosing, Lileng, Lissing, Messing, Pareng, Rengo, Sine, Supsing, Yibuk and Yinku. I have never been to these villages but know all of them as my Dad used to go on school inspection and he used to tell me all the stories. Many of these villages were at that time not connected through road and it used to be generally foot march. The hanging bridge of Lissing was quite dangerous and not everyone could dare to cross that. The school that I went to is called Boum Kakir Mission meant primarily for Orphans or under privileged children but few kids were allowed from regular background as well. Boum Kakir was an orphan worked very hard even with hardships and this story was famous among the local folks and hence the school was named so. The school had very picturesque location and we could the Simang river down the valley. The amazing scenery that we used to have all around that we never use to give it such importance. It was more like a daily affair for us. I still remember the early morning fogs (natural ones not what we have in Indian cities these days) and the chill it used to bring. Boleng was closer to District Headquarter of West Siang called Along which was around 45KM and about 100KM from its own headquarter Pasighat. I remember the days when people had to travel to Along if they have to make phone calls. We did get a telephone exchange around 1997 but the calls were not that easy those days and it used to cost quite a lot to make Trunk calls. I remember that Boleng was so far tucked away place that there were no newspaper. As you can imagine with such small population there was no theatre or restaurants or any of the normal past times that we have in the well connected cities. I still remember that only in 1992 during Barcelona Olympics we had got the cable connection and the whole community funded the dish antenna and the whole setup. There used to be some TV tower earlier that used to transmit only Doordarshan. As a kid I remember looking up the Atlas for Boleng but the maps those days did not had this place. Even with the remote location probably because our school library we had access to almost Enid Bylton’s Famous Five series, Hardy Boys, Nancy Drew, Tell Me Why, Britannica’s Encyclopedia and many more. I still remember reading many of these books is some quiet beautiful location that we had in and around. Those days I didn’t know there is something called Trekking but we use to go out in the wild very often. There used to be road that was under construction to place called Rumgong which was our favorite place to hang out. I have so many memories of Boleng which I left in 1998 which is more than seventeen years ago but even then they are so fresh in my mind.Hopefully I get a chance to go back again and live some of the memories again. I don’t have pictures to share unless I go back there or catch hold of some of my school friends who are there. Being so close to nature always affects your personality and perhaps in a better way.